Medical Fair Asia 2018: A refined approach to keyhole surgery - Healthcare Asia Daily News | Asia's Leading News and Information Source on Healthcare and Medical Industry, Medical Technology, Healthcare Business and R&D, Healthcare Events. Online since 2010. : Healthcare Asia Daily News | Asia's Leading News and Information Source on Healthcare and Medical Industry, Medical Technology, Healthcare Business and R&D, Healthcare Events. Online since 2010. 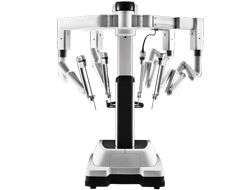 American company Intuitive Surgical has introduced its fourth generation da Vinci surgical system, an FDA-approved robotic surgical system that allows the surgeon’s hand movements to be translated into smaller, precise movements of tiny instruments inside the patient’s body and perform complex minimally invasive surgical procedures with precision and accuracy. The system is an advanced robotic platform designed to expand the surgeon’s capabilities and offer an option to open surgery. “There are currently six systems of various generations actively being used in Singapore and one system newly installed in Vietnam, with interest growing in many other Asian countries,” said Kathleen Melu San-Diego, Transmedic representative, speaking at the Medical Fair Asia show, held in Singapore, recently. The 3rd and 4th generations come with an endowrist attachment. The wristed instruments bend and rotate far beyond the abilities of the human hand. Tremor filtration and Intuitive motion technologies allow the surgeon to operate with steady, natural motion while cutting, sealing, and stapling. The system combines the functionality of a boom-mounted system with the flexibility of a mobile platform. The hybrid architecture allows for four-quadrant surgery without having to reposition the surgical cart around the patient. A laser targeting system helps to accurately position the patient cart. Once the scope is attached, simply point it at the target anatomy and the system will position the boom in an optimised configuration for the procedure. Optics mounted at the tip of the scope put the camera inside the patient, and allow the surgeon to see anatomical structures with better definition and more natural colours. The camera, endoscope, and cable have been integrated into one small, handheld design to reduce the need for draping, focusing, white balance, or calibration. A special button allows images to be saved onto a mounted thumb drive. The da Vinci Xi Surgical System is designed to be fluorescence-imaging capable. By improved technology for physicians, Intuitive says it produces better outcomes for patients.